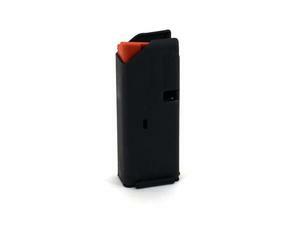 ASC 9mm 10 round magazine for use with 9mm AR-15s or AR-15 conversion blocks. Stainless steel body, anti-tilt follower, chrome silicon spring, black mar-lube finish. Worked great. I have a Pro Mag conversion block and the Pro Mag Magazine did not hold the bolt open on the last round, but this one did. The magazine also dropped out like it should. These are great magazines for the price. I use it in my dedicated 9mm lower with no issues at all. If it isn't working properly in your conversion block then adjust the block - there is a reason they made the position adjustable in those! I bought one for my CMMG with a conversion block, it just doesn't work, it fits very tight and the BCG doesn't travel all the way forward as it should, get the metalform instead. I bought 2 of these to test them out in my Spikes 9mm AR and they are flawless. Nice thick walled magazine body and a clean weld make for a solid performer. The follower allows for last round bolt hold open. I will never spend $40+ on another 9mm mag again. Thanks RifleGear.com for a solidly built and affordably priced 9mm AR mag. BTW: Shipping was fast and reasonable. It shipped from CA to NY in 2 days!